In the 21st century, games can potentially be used as serious educational tools. Today's learners are distracted easily, and game-based learning is the silver bullet because it can potentially immerse the students in content and curricula. Not only does game-based learning with its power to engage and motivate users make the course come alive, but it can also provide a platform in critical thinking, creativity, instant feedback, and collaboration. One of the biggest challenges in education is the different learning styles of the students; game-based learning can easily overcome that. Games can be categorized into different genres such as action, adventure, fighting, puzzle, role-playing, simulation, sports, or strategy. Game designers can potentially select the appropriate genre best suited for effective learning. Even with all the advantages of game-based learning, some challenges, such as unwillingness of teachers to change or improper design of educational games, still exist. With students sometimes far ahead in the use of technology, some teachers who are left behind can be intimidated. The conceptual generation gap in this regard is quite wide, and designing, developing, and implementing games in curricula can be expensive. Though some games can be repurposed for education many cannot be repurposed to meet the expectations of the students. The idea that the American educational system does not favor the low-income students is not a new revelation. The admission process at top-tier universities has become intentionally complex to weed out unwanted students (Berg, 2016). Berg also points out that the percentage of blacks and Latinos graduating from college is lower than the percentage of whites. 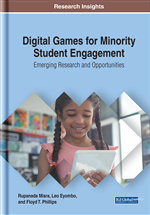 For more than two decades, researchers have been looking at the connection between computer games and education, authoring over 600 articles. Games studies vary by research purpose, methodology of data collection and analysis, and genre adopted (Ke, 2009). Educational games have gained the interest of many scholars because these games are used for a purpose besides just fun, and these games contain carefully thought-out educational purposes (Breuer & Bente, 2010). The advancement of the Internet revolutionized game play by creating a massive virtual arena where players can connect, interact, and compete. With mobile technology, participants can engage anytime from anywhere (Johnson et al., 2013). The application of games in education, known as Game-Based Learning (GBL) is much more than just integrating digital games into the curricula but rather using games to increase critical thinking, creative problem solving, and teamwork in learners (Johnson et al., 2013). In our new information age, most learning is happening outside the classrooms, challenging the traditional model of the classroom-based education. Students who are raised using technology have less patience to sit in classrooms and listen to their teacher. Alternative models of education such as game-based learning are slowly evolving (Collins & Halverson, 2018). Today, young people are keeping up with new media and new technologies. In the case of young adults between the ages of 18 and 29 in the United States, for example, 97 percent have access to the Internet; 75 percent have access to broadband; 20 percent own tablets; and 95 percent own cell phones (Zickuhr & Madden, 2012). For today's students, computers have become the way of life and their ways of thinking and processing information have changed from how older people process information (Prensky, 2003). They have a different mindset, and it is natural for them to feel comfortable learning in a gaming environment. If the educational games are designed appropriately they will provide a platform for the learners to not just acquire knowledge but also to retrieve and apply the knowledge that they have already acquired. As compared to the text-book approach, in which the students are left to come up with novel ways to apply their knowledge in solving problems, an educational game environment provides an opportunity to apply retrieved knowledge relevant to a particular task (Bransford, 2000). Brandsford argues that this “conditionalized knowledge” approach can promote effective learning. People love to play games is because it is fun. Different scholars have different perspectives on what “play” means, and there is some level of ambiguity in what “play” means. Play within games does not necessarily always associate itself with pleasure because not all playful activities are pleasurable. Therefore, Vygotsky argues that defining play on the basis of pleasure may not be always correct (Vygotsky, 1967). Vygotsky explains that play continually creates a demand on the child to observe the rules of play and thus acting against the immediate impulse. Vygotsky concludes that the essential attribute of play is a rule. One may argue that game may be a problem-solving activity. But there can be so many problem-solving activities which are not play. Schell (2008) explains that “a game is problem-solving activity, approach with a playful attitude.” McGonigal (2011), in her book Reality is Broken explains that when we strip away the genre differences and all its technological complexities, all games have four defining features—a goal, rules, feedback system, and voluntary participation. McGonial argues that competition and winning are not the defining characteristics of a game but rather the state of being intensely engaged and the urge to keep playing.